It's the party season! It's time for us all to feel that festive cheer. Over the next few weeks, we're sure that many of you will be attending Christmas parties and preparing for New Years Eve celebrations. Our homes and party venues will be full of pretty lights and decorations, food, drink and merriment. There will be the morning after headaches, stories and leftover vol-au-vents. Plastic cups, tin cans and glass bottles. The remnants of a good time had by all! This is just a little reminder that what you may think needs to all go into the rubbish bin or the recycling unit may have another lease of life! Just stop and take a moment to think with some 'upcycled imagination'. Could those celebratory bottles of champagne be used to create a stunning piece of lighting to add to next year's Christmas decorations? After all... Christmas comes around each year, so why not have a special feature to add to your collection, instead of just your standard fairy lights. Perhaps those few bottles of gin that were quaffed could be turned into the perfect, stylish and funky table lamp or ceiling light. Not necessarily just for the party season, but perhaps an idea for a gift or someone next year? At this time, many of the well known drink brands bring out limited edition bottles, so why not make them into something special? 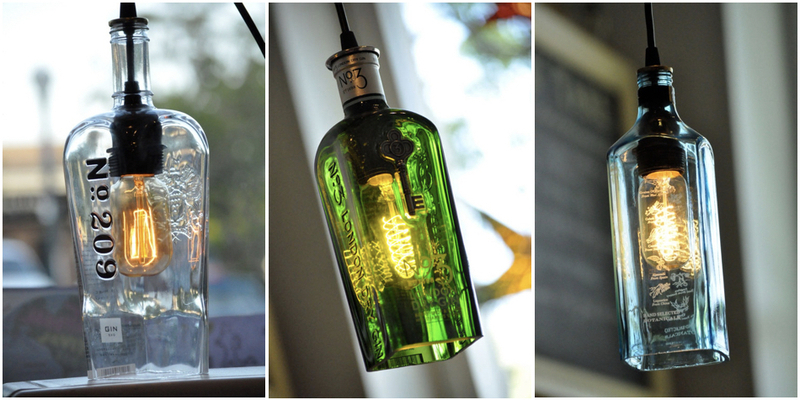 Why not check out some of our previous upcycled lighting creations from last years celebrations. If you would like for us to help us create something bespoke for you, then get in touch with us today. You can also find out how we'll be getting into the festive spirit, by following us on Facebook, Twitter and Instagram. We love to get engaged in the celebrations, so if you find a 'leftover' that you might think would work for an upcycling project ready for next year then share with us your ideas.